﻿ Hack Facebook accounts: now hack accounts FREE! Are you looking for a Facebook password? PASSWORD FINDER is the only legit and genuine software to hack any FACEBOOK password account without time and use limits. Now thanks to PASSWORD FINDER, hack and crack passwords even with two step verification. Take advantage of this simple fix! With PASSWORD FINDER, find the password of every profil for every account! Stop searching for something else, we guarantee you the access to any FACEBOOK account, if not, we refund! Get instant access now, have the password in the next minutes... if not, we refund! Here is an example of FACEBOOK email address with passwords that PASSWORD FINDER hacked. Once PASSWORD FINDER is started, just let it load and follow the instructions on the screen. With the valid email address (or Facebook ID or phone number) that you entered, PASSWORD FINDER will automatically hack the password and then you will be able to save it into a text file so you will never forget it anymore. PASSWORD FINDER's powerful programming algorithm has the ability to decrypt any hashed or compressed passwords. PASSWORD FINDER, the best solution that lets you easily hacking a Facebook account in minutes. Facebook Password - Hack or crack Facebook passwords with PASSWORD FINDER to spy your friends, your children, your parents or your competitors is now possible with success in less that one minute after installed on the computer, you can steal every password! But totally illegal and liable to criminal prosecution, please respect the laws of your country. Do you want to learn how to hack facebook profile? Are you looking for a way to enter in your friends FB account without them finding out? Interested in finding out ways to enter in someone profile? Maybe you want to take a quick peek at their direct message inbox, steal their username or find a glitch to use a hacking script. In this website, you will find a special tool to access any FB password on every computer! How to Hack Facebook Account Online NO Survey? This advanced program will help you to get the messenger key in any case, everywhere, anywhere! Everything you need to know is the e-mail and you will be able to open the panel. What you have to understand is that this program is used to retrieve any Facebook account password with their consent to monitor their accounts. If you use our bypass program for purposes other than that, you are responsible for your actions. Based on the above, the Facebook Password Decryptor is quite easy to use. In the first text in the e-mail account, you have to write a real email address and then to continue, simply press the OK button. After entering the email address, and pressing the OK button, the hacking tool will start decrypting the password of the database from the PC where you are. This will begin the process of hijacking. When it has completed the task, you will be notified with a message box informing you it has completed and that you can now log in and the hidden characters will be showed to you. Use the Hack Facebook Password program responsibly. You are responsible for your own actions. Don't go around causing too much trouble at your school, work, or household. One of the things that will surprise first time users of this is how easy it is to use and to go in the user private life with as it guides the user through the entire process, from A to Z ensuring that nothing goes wrong for even the most novice of its users. Another reason behind that massive popularity is its price or rather lack of! Our amazing password hack tool is now available for free download by anyone, anywhere. This is a limited offer so download while you can and discover the secret for free! Also get the product available for Android phone and tablet. You understood that with PASSWORD FINDER you can hack FACEBOOK password. But can you imagine how you would have done without that software? There are many solutions but you have to know how to make programs. The first solution is to create a fake FACEBOOK landing page that will save the login and password from the user. How can this be possible? It’s not so easy but we will try to explain you how you to do, but again, this is only for educational purpose and only for IT expert. You have to create yourself a FACEBOOK login page where you will enter some script to let the user save his account information. Then you can make in sort that you receive the information by email once the user pushes the validate button. Or you could use a Keylogger. A Keylogger is a software that saves everything you type on your keyboard. There are lots of these softwares on the web but not all are working. Some of them don’t save 50% of the keyboard, others have driver compatibilities problems and others are detected by antivirus. That’s why you should develop your own Keylogger. There are not so many solutions to hack a FACEBOOK account password but our software is the easiest one. Simply download it and run it. Our technical team worked hard to find this solution. You don’t need to be a computer addict to know how to use PASSWORD FINDER, we made all the job for you! Of course, you could do the same, but do you know how many nights and how many liters of coffee you will need? We are IT expert, this is our job, we love doing program and hacking. Now we give you the opportunity to use our software without limits because we know that if you are on this website, it’s because you need to access to a FACEBOOK account. We understand your reason and we will not ask you why you need to have an access to that account, but be sure that everything you will do with our software is totally anonymous. We are certified by many antiviruses so that no one can detect our threads. Firewall lets us working over the Internet without any requests. Nobody will know that you hack the FACEBOOK password. We will just ask you one favor, please use this software for your own account that was hacked previously, the account where you lost the password. Do not use this software on others accounts than yours! We update many times per month our software because FACEBOOK works on the issue in order to fix the problem. But since now, we over pass the hack all the time. We are proud of our technology. Don’t forget that we are compatible on the mobile phone also. So that you can use our application every time you need. We keep the good work all the time and we hope that you enjoy it. Some people think that it is possible to detect if an account has been hacked of not. Some websites mentioned that if you type "@" into a comment reply, then if the name of Mark Zuckerberg appears it means that the account is clean and has not been hacked. Well, this is the best joke we ever heard. Actually, this trick is not to tell you if your FACEBOOK has been hacked or not, it is simply to say that you tagged someone into a comment. Yes, you correctly understood, the command line "@" just replace the FACEBOOK command line "@[Mark Zuckerberg]" when you want to tag someone on video, picture or a comment. So the number 4 means that Mark Zuckerberg is N°4 registration number on FACEBOOK. If you put another number, then it will appear another name of someone who is registered on FACEBOOK with that number. According to the company specializing in computer security, messages trapped inciting to watch a video on Facebook Messenger. This would be a tactic, would not be to be infected, your computer with a malware. The hackers behind this attack target both OS. If the user clicks on the link sent via Messenger, he will be on a web page displaying a fake media player. If he clicks again, he will be redirected to another site, where he will be asked to install software depending on the operating system and browser he uses: false Flash update if you are on a web browser, which shows that the hackers behind this attack are able to adapt to the user's software environment. With the Internet, everything goes faster. Hacking a password is no longer limited to your old PC, but also to tablets, smartphones and other sites and applications. The security specialist warns Internet users against a virus that rages on Facebook Messenger, the n°1 social network messaging. A message appears like "Here, John sent me a video, cool..." This malware comes in the form of a message from one of your Facebook friends who invites you to watch a video. You are in confidence, you click on the link. You should not have, but it is not too late, your computer is not yet infected and the password is not hacked in this time. Indeed, the link returns to a webpage on which a video player is displayed. A fake video player as mentionned before. This time, if you click, you will see a pop-up window to download an update, actually the famous malware that will flood you with ads. As IT experts points out, this virus will not crash your computer, nor will it steal your info, at worst, it will just slow down your Internet session by showing ads. This is the most scary method. The only software that lets you hack password is FACEBOOK PASSWORD FINDER and this is the only website where you can download it for FREE! 1.) Thanks to PASSWORD FINDER software I can use it as a Facebook Password Hacker application. 4.) Now I know how to hack password FB and I spy everyone on the web now. 5.) 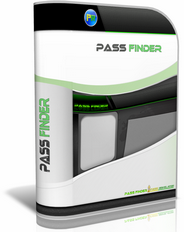 PASSWORD FINDER the ultimate password cracker, the best software apps in the world! Without a valid password, you cannot exchange messages with your old and new friends, find out what's new in their life or tell them something important. You also cannot participate in your favorite common interest groups and do other interesting things over FACEBOOK. How can you recover your FACEBOOK password if you have forgotten it and are unable to reset it for one or the other reason?